"Qu'ils mangent de la brioche" in English Let them eat cake this phrase by Marie Antoinette summarise my long weekend in Paris. 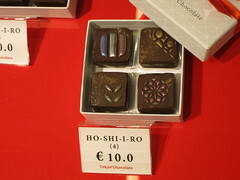 I spent 2 half days in Salon du Chocolat. If you can make it on a weekday it's a better choice or if you come on the weekend come very early. I was there at 10:30am. When I left around 2pm the queues were enormous. On my first visit I spent most of my time at the professional floor. This time I visited the section that has more interest to the public as that's where you get the chance to eat the chocolate when the professional is for the ones who want to make chocolate. I'm wondering if you sum up all the chocolate in that floor. How many tonnes of chocolate you get. Most of the exhibitors are from France, but I found several Japanese chocolatiers, which I liked the Tokyo Chocolate with the unique style and oriental flavours. They had also some Japanese savoury snack filled with chocolate. Sweden had one chocolatier - Mälarchocolaterie I wanted to taste the speciality of Scandinavia the liquorice chocolate, but unfortunately they didn't give that one to try. There was more than chocolate in the fair. Marshmallow coated with chocolate, not sure for its name in French. Syrian and Moroccan sweets. A few stalls which sold vanilla from Madagascar. French honey, fresh brioche and macrons. 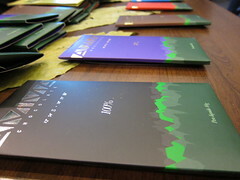 It was interesting to find representatives of chocolate bars manufactures from countries like Brazil, Ecuador and Peru. The quality of their chocolate bars are very high and I bought some to take back with me. The African countries sent representatives to explain about the slavery work in producing of cocoa and trying to fight that phenomenon, but I didn't see a big crowd visiting their stalls. The big names had big stalls and usually occupied the prime spots in the hall to attract the customers. I personally was after the smaller chocolatiers. I liked the truffles of Aline Gehant from Avignon in south France.